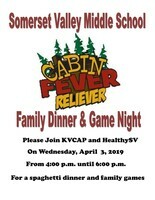 KVCAP and Healthy SV is sponsoring a free spaghetti dinner on Wednesday night, April 3rd for the Somerset Valley Middle School students and their family. Please join us for dinner and games between 4-6 P.M. See you there! 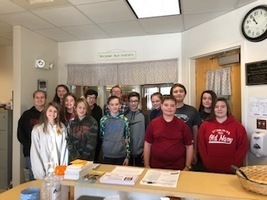 The students at Somerset Valley Middle School had a Penny Challenge for the Salvation Army.They raised $775.50.Third grade brought in the most pennies and they will be treated to an ice cream party.Great Job Everyone!Thank you for your support!Thank you to Kylee Sprague for coming up with the idea! 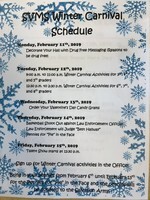 Somerset Valley Middle School's Winter Carnival Activities.Enjoy the fun!! 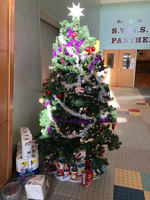 Giving Tree: Somerset Valley Middle school collected over 1200 items to donate to the Tri Town Food Cupboard. 4th grade won the challenge and was treated to a pancake breakfast. Ethan Davis, a fifth grader, brought in 97 items. Grade 3: 100 Grade 4: 432 Grade 5: 216 Grade 6: 230 Grade 7: 106 Grade 8: 145 Awesome job Somerset!! Somerset Valley Middle School is holding a Grade Level Contest. The grade level that collects the highest number of non perishable items for the Giving Tree will be treated to a pancake breakfast on Wednesday, December 19th at 8:15. The food collected will be donated to the Tri Town Food Cupboard. 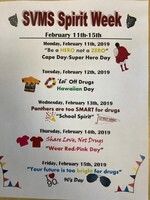 Students at Somerset Valley Middle School particpated in activities around Being Kind and Sticking Together. 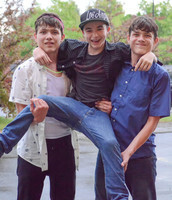 These activities were made possible by Project Love and Duct Tape. 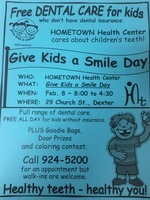 Free Breakfast, lunch and fresh fruit snack. All students at Somerset Valley Middle School will receive free breakfast and lunch and a fresh food snack again this year. We will need all parents to fill out the Parent/Guardian-Economic Status Form that is in the parent packet. Tryouts start August 20, 2018 Girls: 3:00-4:30 Boys: 4:00-5:30 Athletes need permission slips, proof of insurance and a physical to play. 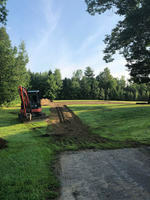 We are very close, within days of getting someone on site at our school to begin the earth work for the new playground. Play Equipment is scheduled to arrive in Newport on or about the 20th of this month. 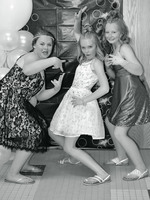 More fun at the Semi!! Having fun at the Glo Dance. Bullying Presentation with Sheriff Dale Lancaster and Deputy Mike Cray. All students K-8 received "Anti-Bullying" Shirts. Thank you to the Sheriff's Department, Northeast Technologies, Crescent Lumber, Leone Concrete Corp, Berg Activewear! 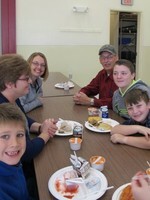 Somerset Valley's third and fourth graders enjoyed a Grandparent's Day Breakfast on Wednesday, November 29th.